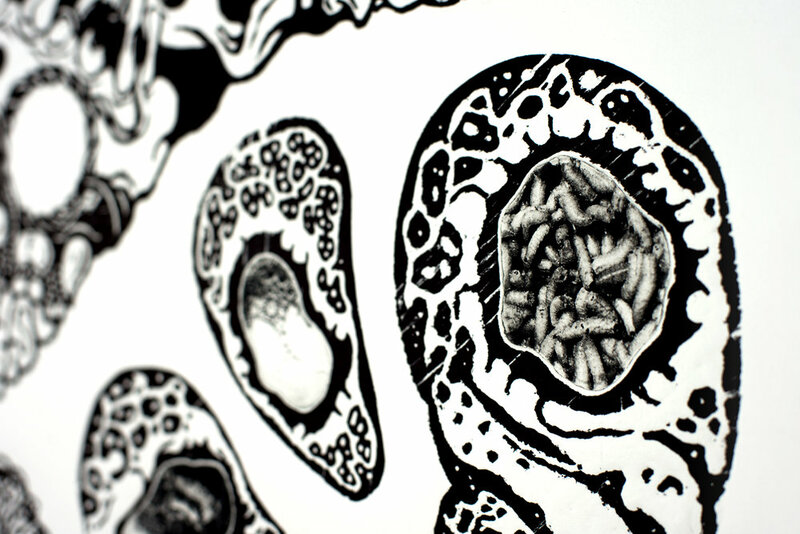 This image was created as a test in combining relief and intaglio printmaking methods and features imagery influenced by grotesque anatomy and disease. The test involved running copper plates on top of wood block matrices through the press at the same time under an equal amount of pressure to create a multi-layered effect in one pass. Print was pulled on Speedball Arnhem 1618 rag paper and is a 1/1 test proof. © 2010-2019 Nick Osetek. All Rights Reserved. All images and content on this site are copyright of the respective artist and are protected under the United States and international copyright laws. Images and content may not be reproduced, copied, stored or manipulated for any purpose without written permission from the artist.